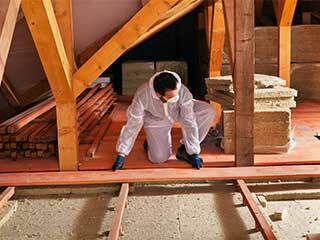 The main purpose of the insulation in your attic is to help regulate the temperature of your home. It serves to keep the heat trapped inside and circulating to warm your house, as well as keep things stable and cool when it’s time for the air conditioning. If it’s not doing its job well, you’re going to see a spike in energy costs. If you’ve noticed that your bill is becoming higher each month, it might be time to spruce up what’s there and add in some filling. You’ve looked up some suggestions, and find a bunch of jargon about R-Values that all goes over your head. So, what now? Let Us Help Make Sense Of It! We’re here to help give you an idea of what it all means, and where you may want to start when it comes to the type. First things first, the R-Value isn’t as complicated as it might seem. It is essentially telling you how effective it is at resisting heat loss. Simply put, the higher the R-Value, the better it does at keeping heat in. More isn’t always better, however. If you live in an area that’s warm on average and doesn’t get nasty winters, you don’t need that higher R-Value. It all depends on where you are, and what is already in place. What About The Different Types? What are batts and blankets, and how do they compare to loose-fill? Mostly, it comes down to the ease of which they’re installed. Batts and blankets come in rolls, which make them easy to transfer and cut accordingly. They’re best for those who want to DIY. However, you must be careful to cut it precisely to fit around pipes and other parts. Simply smashing the insulation in and around those areas can result in drastically lowering the effectiveness of it. Loose-fill is best for making sure every single bit of your attic is covered and keeping the air safely trapped, but it requires a special machine and can be messy. It’s best to have this done by the professionals. This namely depends on your preference! Fiberglass is far less dusty, and therefore simpler to install. It’s flame-resistant as well. However, cellulose is green-friendly, and can also be treated to be fire-retardant.